Reflections on a woman’s small act of kindness that changed the course of Rav Shach’s life as well as the course of Jewish history. 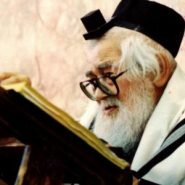 When Rav Shach was already a very old man, he asked his assistant to drive him to the funeral of a woman who had passed away in Haifa. It was a cold winter day, and Rav Shach was already not in good health. The assistant wondered who this woman was that the great Rav Shach would take several hours out of his packed schedule to honor her with his presence at her funeral. When they arrived at the cemetery, the assistant was even more baffled. This woman, it turned out, was an elderly Holocaust survivor with no children or surviving family. There were only a handful of people there, among them Rav Shach, who stood in the back of the room. After the eulogies, the assistant urged Rav Shach to get back into their warm car to drive home. But Rav Shach refused, and insisted, despite the freezing cold, to accompany this woman’s body all the way to her grave. On the way home, the assistant asked Rav Shach who this woman was. “When I was 12 years old,” Rav Shach told him, “I was an orphan. I was starving, dressed in rags. A man came through my town recruiting for a new yeshiva set up by the Zionists. I passed the entrance test, and I went to learn at that yeshiva. It was learning like I had never experienced before, it was amazing. “I didn’t have any food, but that was OK. I was used to starving. What I couldn’t handle was the cold. I slept on a bench in a shul, and I didn’t have a blanket. I was freezing. I was afraid I might die. “My uncle, who was a blacksmith, wrote me. He told me that he’d heard I was starving and freezing, and offered me a job working for him. I wanted to stay in the yeshiva, of course, but I wrote him back that I would leave the yeshiva and come to work for him instead. And that blanket of that widow, Rav Shach explained, was what enabled him to remain in yeshiva. And to become a great Torah scholar, rabbi, and leader of the Jewish people, rather than a blacksmith. I keep on thinking about this remarkable story, which I heard from Rabbi Fischel Schachter. And I keep on thinking about how this widow didn’t think she was doing anything of any importance at all. She didn’t feel right throwing away the blankets, so she went to a rabbi, and gave them away to the needy instead. But that teensy act of kindness changed the course of Rav Shach’s life as well as, it turned out, the lives of his thousands of students and followers. Which has gotten me thinking about how, like that widow who unknowingly changed the course of Jewish history, I can be 1% kinder, generous, and good to those around me. My children, my husband, my neighbors, and Jews and human beings around the world. Thank you for sharing this wonderfully helpful story!